Looking to sell your own indie comics and art to a growing, targeted, comic-loving, audience? Well, it couldn’t be easier to open your own ‘Comicsy Shop’ and take full advantage of being a part of a shopping network of like-minded creative types. It often feel like the comics scene here in the UK is under appreciated. Especially when you see how influential and popular comics can be in countries such as America, France, and Japan. However, you only need to visit one of our many vibrant comic conventions or expos to see that the UK small press scene is not just thriving, but bursting with original and exciting work of an astoundingly high level. For talented individuals who are not technically inclined, setting up your own website can be a real pain. Some already have their own website to sell the fruits of their labour, but being discovered amongst the millions of other websites out there, in the big world wide web, can be virtual impossible. Our goal is to bring these people together in one simple, easy to use website. It’s a simple idea – strength in numbers. We hope you agree it’s worth your time. On Comicsy you can sell both physical goods (ideal for selling items that are already printed) and digital goods (suitable if your print run has been exhausted). If someone purchases a tangible product, you will receive an email containing the customer’s details. Simply package the goods and ship them off. If someone orders a digital product, simply email them the file. If you have already built your own website, or added your products to another marketplace, you can link your Comicsy products to these existing sites, so customer looking to buy your products are automatically directed there. This option is ideal for users who sell products via print-on-demand services such as Lulu, or for users who have their items on Amazon. Comicsy is all about promoting the UK indie comics scene and rewarding its sellers for being a part of the Comicsy network. Sign up for a FREEMIUM Comicsy account and receive 100MB of storage space. You can use this space to sell hundreds of tangible products and a small number of digital comics. Should you run out of storage space it’s easy to upgrade to a Comicsy Pro account, packed with additional features. All you need to get up and running on Comicsy is a Paypal account and some products to sell. You can have your own store up and running in a matter of minutes. Comicsy is built using the WordPress platform. According to Wikipedia, “WordPress was used by more than 22.0% of the top 10 million websites as of August 2013. WordPress is the most popular blogging system in use on the Web, at more than 60 million websites.” WordPress has become a global brand thanks to their system’s easy to use controls, flexibility and security. 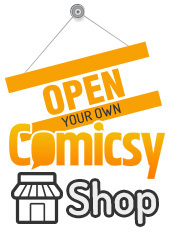 If you’re looking to create or develop your own brand you can style your ‘Comicsy Shop’ to reflect your image. Upload your own banner/logo, customize your own colour scheme and choose your own fonts, to make sure your customers know who they are buying from. As a Comicsy seller you can add news updates and articles so your customers can keep up with your latest products and news. Include text, pictures and videos in to your posts using the standard WordPress technique. Use the inbuilt product uploader to import your catalogue of products. Joining Comicsy is FREE. You choose how much you want to sell your products for and all transactions are processed via Paypal. Unlike most online marketplaces Comicsy does not charge a fee! There is a small transaction fee charged by Paypal. The remaining money goes direct to the you. When you create a Comicsy Shop account you will be placed on the FREEMIUM level of service. This gives you access to all the great standard features associated with Comicsy and your products will appear on the main Comicsy site as well as your own individual store. The FREEMIUM account comes with 100MB of storage space for you to upload images and digital files. That’s enough space to upload hundreds of physical products with their own images but only a small number of digital downloads. Should you run out of space you can always upgrade to a Comicsy Pro account. Do I need a Paypal account to sell items listed on Comicsy? Where do I enter my Paypal details? How do I customize the appearance of my Comicsy Shop? Can I link back to my own blog/Deviant art page/website? Adding products is easy but can look a little daunting at first. Take a look at our Adding New Products Guide for an overview of what you will need to do to add an item to Comicsy. Yes. In order to receive payments for successful sales you will need to enter your Paypal email address. In the Comicsy Easy Admin panel, on the ‘Store Settings’ page, There is a ‘Payments’ tab at the top of the page. Click the tab and enter your Paypal email address. Then click ‘Save Changes’. Sorted. You can alter the colours, fonts, and header of your store to suit your own brand/image. Take a look at our Store Design Guide here for more information. Comicsy has multiple shipping options, allowing you to fine-tune your postage and packagin charges. To learn more about the topic visit our Postage & Shipping Guide found here. In the admin panel there is a section called ‘Links’. You can add as many links to as many websites as you want. These link will appear on your own store page in the bottom menu.